Choosing a school for one’s child is an important decision. Parents with children in local First Schools will receive an invitation to attend our Prospective Parents’ Open Evening held in the Autumn Term. This provides an opportunity to meet the staff and take a tour of the school. 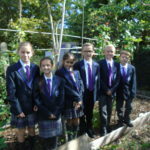 We also offer two Open Mornings when any parent or guardian is welcome to visit the school and see St Peter’s in action. Entry to this school at the beginning of Year 5 is arranged by the Local Authority. Parents apply to the Local Authority in the October preceding the year of entry. Places are allocated using our own admissions criteria. See the Admission’s Policy on the website. In order for us to fully consider your application you will need to complete the following documentation and return it to the school. If you are moving then we will require satisfactory proof. We will accept photocopies of documents. The Head of School is only too happy to provide prospective parents with a guided tour. Please contact the school office for an appointment.